You are here: Wade Thomas Parents Association > Programs > All Posts > Featured > Introducing… WTPA TOWN HALLS! We heard you and we’re responding! Many parents are looking for a simple way to learn more about what’s going on at school, to share their ideas, and to potentially get involved – but with a more casual agenda and more flexible timing than a WTPA Meeting. 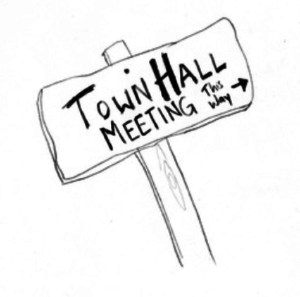 Introducing… WTPA TOWN HALLS! We plan to offer these forums monthly, to focus on what YOU want to discuss, and we’ll schedule morning and evening times throughout the year to better accommodate your schedule. We will offer two times for our first month – Wednesday Aug 29 at 8:35am and 6:00pm. Join us in the Library!